SPACE IC is a privately held company which was founded begin of 2014 as a spin-off from Telefunken Semiconductors. The roots of the founders and their actual focus are in the development and manufacturing of analog integrated circuits with challenging requirements regarding quality, robustness and reliability. SPACE IC supplies ITAR/EAR-free radiation-hard IC products for space flight systems with focus on power management and interface applications. The company is a fabless semiconductor supplier with proven expertise in developing radiation-hard analog IC products. For manufacturing SPACE IC works closely with experienced subcontractors and manages the complete qualification and production processes in compliance with the demanding quality requirements of space programs. At the European Space Components Conference ESCCON 2019 at ESA ESTEC, Noordwijk, in the Netherlands, SPACE IC presented about integrated circuits for modern power distribution in satellite payloads. Read more..
SPACE IC was present at the electronica 2018 in Munich from 13th to 16th of November, 2018 to meet customers and suppliers. Read more..
SPACE IC presented about modernization of power distribution in satellite payloads with its POL converter IC in ESCC certification, and about LVDS transceivers. Read more..
SPACE IC meets customers and suppliers on 24-Oct-2017 at Space Tech Expo in Bremen. Read more..
SPACE IC wins 3rd prize in Airbus Defence & Space Challenge at INNOspace Masters on 17-May-2017 in Berlin. Read more..
At the 3rd Paris Space Week (PSW) 2017 at the Paris Orly Airport, France, SPACE IC discussed new developments and the application of SPACE IC products with space customers. Read more..
At the 11th ESA Workshop on Avionics, Data, Control and Software Systems (ADCSS) 2016 in Noordwijk, The Netherlands, SPACE IC presented on Easy Applicable POL Converters. At the European Space Power Conference (ESPC) 2016 in Thessaloniki, Greece, SPACE IC presented on Efficient and Cost Saving Secondary DC Power Distribution. Read more..
SPACE IC was present at the ESA ISD 2016 in Noordwijk, The Netherlands, to meet customers and to inform about the current state of product development and qualification. Read more..
SPACE IC point of load converter ICs feature flight heritage since 2015 by running an in orbit demonstration in the Kent Ridge 1 satellite. For telemetry data read more..
SPACE IC was present at the ILA 2016 in Berlin from 1 to 4 June to meet customers and suppliers. Read more.. Launch of the internet portal of the German space small and medium enterprises (SME) which are organized in the German SME space working group. 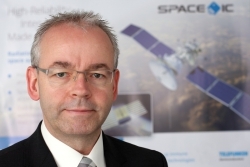 Read more..
At the DLR Components Conference 2016 in Cologne and Bonn, Germany, SPACE IC gave a lecture on satellite cost reduction by POL architectures. Read more..
SPACE IC signs distribution agreement with Triumpower. Read more..
SPPL12420RH Flight Models in hermetic ceramic flatpack 16 are available now for customer order. Read more..
SPACE IC signs distribution agreement with KAMAKA. 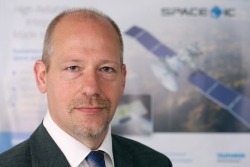 Read more..
SPACE IC presents the first European POL converter IC on the Space Tech Expo in Bremen, Germany. SPACE IC publishes the article "Electronic Components: A Tiny Chip Manages Power Supply in Light-Weight Satellites" in the DLR Newsletter COUNTDOWN. Read more..
SPPL12420RH Engineering Models in hermetic ceramic flatpack 16 and Evaluation Kits are available now for customer order. Read more..
At the International SpaceWire Conference 2014 in Athens, Greece, SPACE IC presented radiation test results of the extended common-mode LVDS (SPLVDS032RH, SPLVDS031RH) ICs targeted for SpaceWire. Read more..
At AMICSA 2014 in Geneva, Switzerland, SPACE IC presented radiation test results of the first European POL (SPPL12420RH) and LVDS (SPLVDS032RH, SPLVDS031RH) ICs for space. 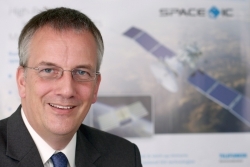 Read more..
SPACE IC wins the "Innovation Award 2014" at the ESA Industry Space Days in Noordwijk, The Netherlands. Read more..
At the DLR components conference SPACE IC presented the first European radiation hardened point-of-load and LVDS ICs. 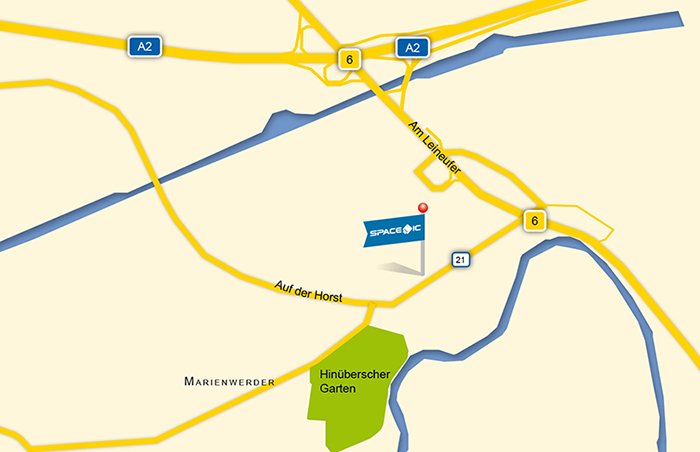 Read more..
SPACE IC set up the new headquarter in Hannover, Garbsener Landstraße 10. SPACE IC got nominated for "idea award" and wins "plug&work award" of the hannoverimpuls business development and location initiative.Read more.. Begin of 2014 the company SPACE IC was launched as a spin-off from TELEFUNKEN Semiconductors in order to manufacture and supply radiation-hard analog IC products for space applications and to develop next generation radiation-hard products. SPACE IC and TELEFUNKEN Semiconductors sign an exclusive license agreement on the IP for radiation-hard products. 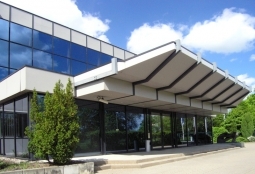 In 2009 the development of robust analog IC components was started at TELEFUNKEN Semiconductors in Germany. In 2013 POL and LVDS IC components passed TID and SEE radiation tests. Small and medium size enterprises (SME) play an important role in the German space industry landscape. A large number of SMEs is involved in the development and manufacturing of subsystems and components. It is a reflection of their high level of technological competence. SPACE IC is a member of the German SME working group for space flight AKRK (Arbeitskreis Raumfahrt KMU) hosted by the German space agency DLR. The function of AKRK is to represent the interests of German space SMEs, to exchange information, to debate specific topics and to work on solutions and recommendations to improve the chances for space related business and collaboration of German Space SMEs. 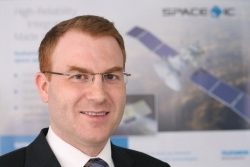 „Best of Space – the backbone of business“ is the internet portal of the German space SMEs. The portal provides an overview of the innovative power and technical expertise of approximately 40 German companies. As an active member of the AKRK space working group, the expertise of SPACE IC is also presented on this unique portal. SPACE IC develops and manufactures unique ICs for space applications. Our products are resistant to radiation, hermetic and extreme thermal and mechanical loads. They enable the development of state-of-the-art energy-efficient and cost-effective satellite systems. The development of our switching regulator IC for energy management in satellites has been awarded the Innovation Prize of the European Space Agency ESA. The focus of our activities is the development and qualification of the analogue integrated circuits and their special aerospace housing. In manufacturing we cooperate with experienced manufacturers of the aerospace industry. As part of the European space community, we are closely linked to the space agencies DLR and ESA. Our employees work with a high degree of autonomy and responsibility in their specialty and keep an eye on the interrelated contexts and quality aspects. This requires intensive communication within the team and with suppliers and customers connected to SPACE IC. If you would like to participate in extraordinary tasks and to help shape our young emerging company, please send your application to info@space-ic.com.